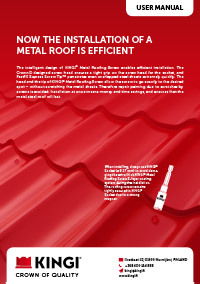 The intelligent design of KINGI® metal roofing screws ensures an easy installation of the metal roof. The patented FastFX™-screw tip drills quickly into the intended spot, and does not slip on the color coated sheet. 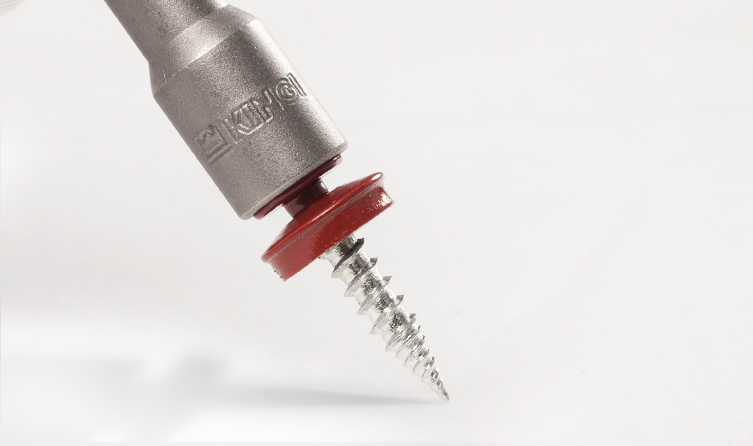 Thanks to its unique thread, KINGI® screws drill quickly also through overlapping metal steel sheets. With KINGI® screws you get no sharp steel particles from the metal steel sheets, which means there are no scratches to the color coated surface or rusty stains on the roof either. The crown-shaped screw head (CrownD) secures a firm hold to the socket. Thanks to its high screw head, KINGI® screws can be fitted tightly. If a screw does not stay firmly in the socket, the power drill may slip and scratch or even dent the color coated metal sheet. With KINGI® screws, there is no need for overpainting any scratches, which will save you money and make your roof last longer. KINGI® kateruuvi porautuu täsmällisesti juuri haluttuun kohtaan nopeasti, katepeltiä naarmuttamatta ja peltilastuja irrottamatta. Tällöin vältytään ruuvin aiheuttamien naarmujen maalaukselta. Kerralla valmis asennus säästää aikaa ja rahaa, ja varmistaa teräskatteen kestävyyden. The patented FastFX™- screw tip drills quickly through overlapped metal steel sheets. It makes it easy to drill the screws into the intended spot without scratching the color coated metal steel sheet. The eu model-protected crownd-screw head fits firmly into the socket and ensures firm fitting. The powerful magnet inside the KINGI® socket keeps the screw head firmly in place during drilling. This makes it easy to install screws even in difficult positions without any slipping. When you use the KINGI® socket (ø 8.27 mm) the surface of the paint of KINGI® metal roofing screws will not be damaged during installation. Please check out the installation- and maintenance instructions, also the warranty terms as well. Are you interested in KINGI® metal roofing screws?